Episode 52: Misty Massey at Atomacon! Episode 52! Starneslord, Carol the Cat and the Giddygeeker headed to Atomacon in Charleston, SC and were able to host 3 podcasts while we were there! The yummy goodness in the middle was author Misty Massey! ! 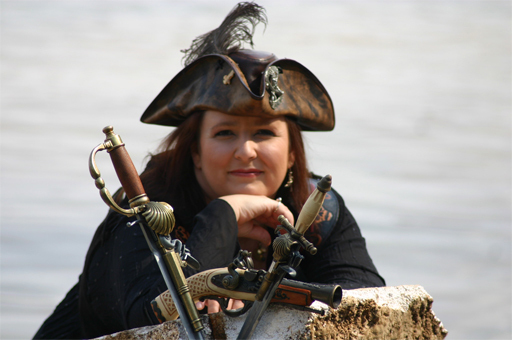 Misty Massey is the author of Mad Kestrel series (Tor Books), a rollicking adventure of magic on the high seas which was nominated for the 2010 SCASL Book Award. Misty is one of the featured writers on the Magical Words.net blog, along with David B Coe, Faith Hunter, A J Hartley and Stuart Jaffe. When she’s not writing, she studies Middle Eastern dance. Misty’s short fiction has recently appeared in the Rum and Runestones anthology (Dragon Moon Press) and the Dragon’s Lure anthology (Dark Quest Books). ← Episode 51: Nicole Givens Kurtz and Alexandra Christian at Atomacon!